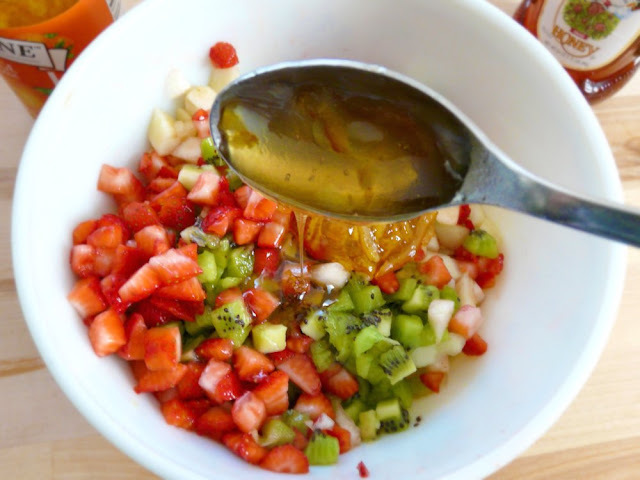 The Red Gingham: Fruit Salsa with Baked Cinnamon Chips + a Korean BBQ feast! 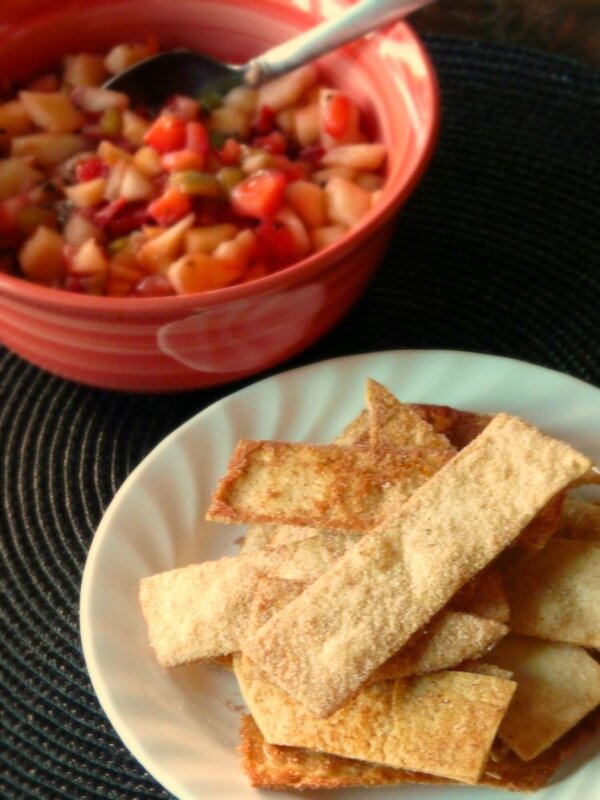 Fruit Salsa with Baked Cinnamon Chips + a Korean BBQ feast! As Gingham Girl mentioned in a previous post, one of our friends, E, hosted a wonderful Korean BBQ dinner at her home last week. I love Korean BBQ and it was so much fun to have had it in the comfort of her home with a bunch of our closest friends. Boy, did we pig out! I know I did. I brought fruit salsa with cinnamon chips for dessert but before we get to the recipe, I wanted to share some pics of our yummy Korean BBQ spread. We had two grills going at the same time as there were 7 of us. See the three stacked plastic containers to the right? The top had spicy Korean miso paste, middle one had spicy cucumber salad and the bottom one had kimchee...my favorite! For the meat, we had very fresh, thinly sliced beef and Korean bacon. This was my first experience with Korean bacon (called Samgyeopsal). It's not like regular bacon as it's uncured and is basically pork belly that's thinly sliced. I must say I enjoyed it immensely. We've got the grills sizzling now! 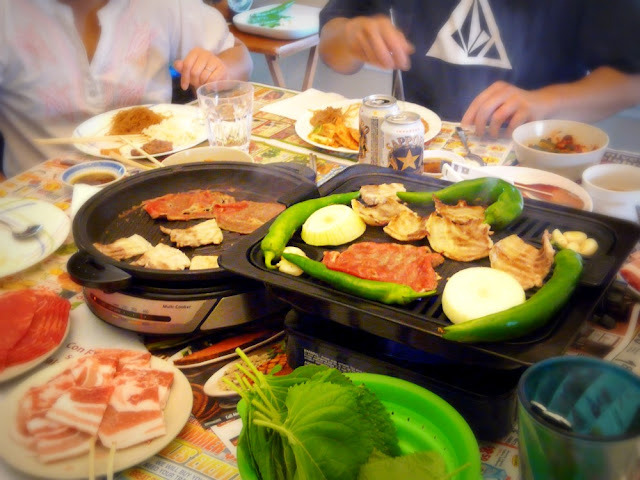 On the right grill, we also had Korean peppers, garlic gloves and sliced onions. The Korean peppers are mild and a little sweet in flavor...delicious! 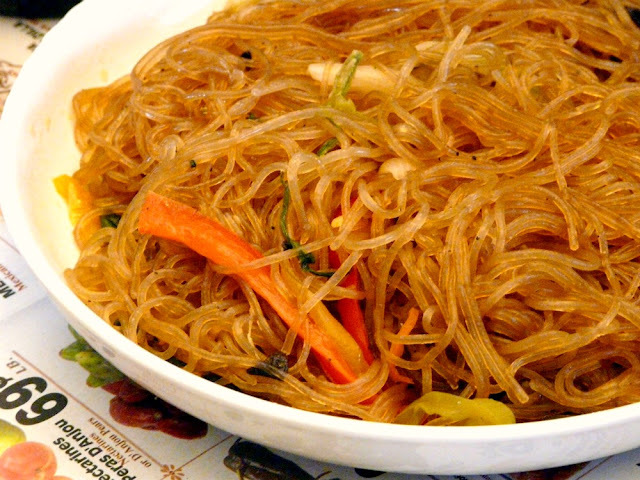 We also had Japchae, a very popular Korean noodle dish made with cellophane noodles. This is one of Gingham Girl's favorite noodle dishes. And of course we had kimchee. Did I already mention that it's my favorite? refreshing minty taste and went really well with the grilled meats. 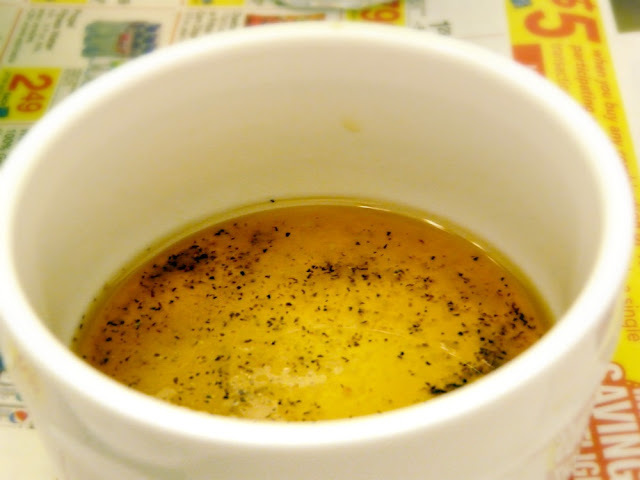 This was our dipping sauce which comprised simply of sesame oil, salt and pepper. A popular way to eat Korean BBQ is to dip the grilled meat in the sauce, place it on a lettuce leaf or a perilla leaf, top with kimchee, wrap it up and devour. So good! I've made this a few times now and I'll be honest, it can be time consuming to dice up so many fruits but it's totally worth it. It's a refreshing and light dessert that's perfect for hot summer days. I usually serve this with homemade baked cinnamon chips but you can also use store bought cinnamon chips or even graham crackers. 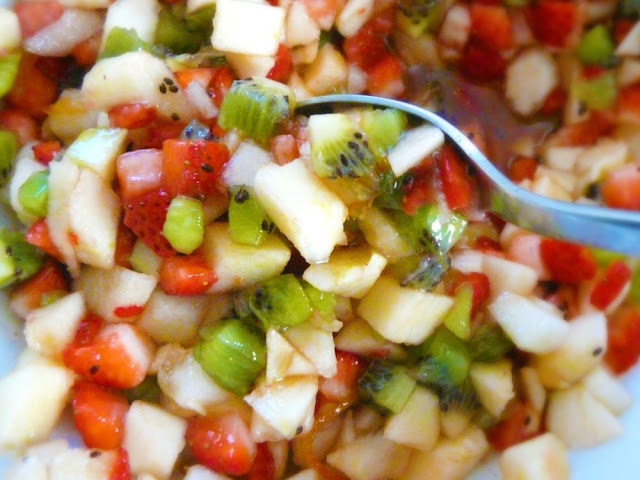 The beauty about this fruit salsa is that you can mix and match any combination of fruit that you like. 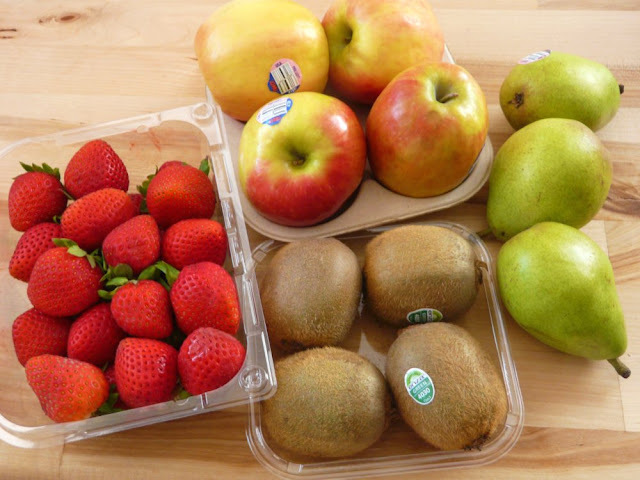 I initially wanted to do a tropical fruit salsa but the mangoes at the store I went to looked too beat up to go into my salsa so I settled for just a typical fruit salsa with apples, strawberries, kiwis and pears. Recipe yield: About two and a half pounds. It may seem like alot but if you're already taking the time to dice everything, might as well make a big batch of it. At least that's how I see it. Trust me, it'll go quickly. You can spoon it over vanilla ice cream or add some to yogurt to create a parfait. I like it with cold milk and cereal too. 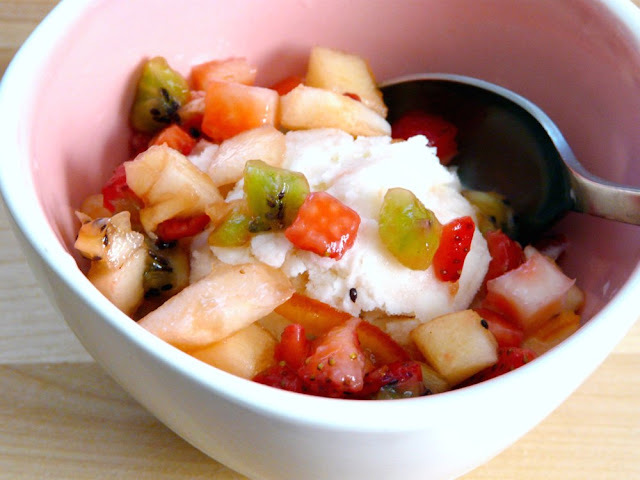 This fruit salsa makes for a refreshing dessert when served over homemade vanilla ice cream. Add one tablespoon of lemon juice each to the diced apples and diced pears. The lemon juice is added to prevent browning of the fruit. 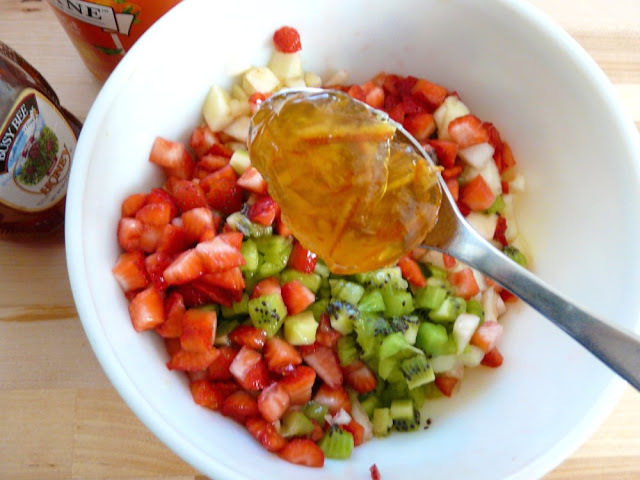 Combine all the diced fruit in a large mixing bowl then add the marmalade and honey to it and stir together well. Set aside in the refrigerator to chill. ...and in goes the honey. While the fruit salsa is chilling, prepare the tortilla chips. Melt the butter in a microwave-safe bowl. 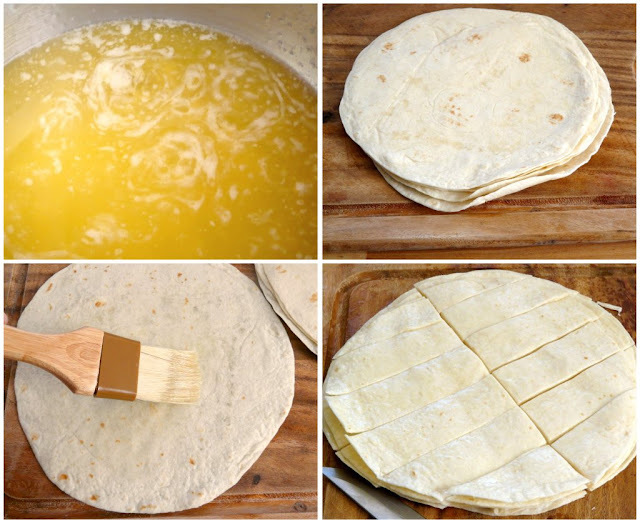 Place the tortillas on a chopping board or work surface in a pile. With a pastry brush, lightly coat both sides of the first tortilla with butter. Move it to a separate pile. Take the second tortilla and stack it on top of the first buttered tortilla then lightly butter the top side of it. The bottom of the second tortilla will absorb some of the butter from the first tortilla while it's resting on it. Continue doing this until all the tortillas have been lightly coated with butter. Cut the tortilla stack in half then into strips. In a large plastic bag, combine the sugar with the ground cinnamon and shake to mix well. Add the buttered tortilla chips to the bag in portions, making sure not to overcrowd the bag. Shake the bag vigorously until the tortilla strips have been coated with the cinnamon sugar. You will need to use your hands to separate the pieces that are stuck together. Lay the sugared tortilla strips in a single layer on a baking sheet lined with foil. Bake in the oven for 9 to 10 minutes until golden brown. Transfer them to a wire rack to cool. The chips will continue to harden while they're cooling off. Repeat until all the tortilla strips have been baked. Serve with the chilled fruit salsa. Or enjoy them on their own. Either way, they're addictive. Melt the butter. Gather the tortillas into a stack. Butter them up then cut them into strips. Mix the cinnamon and sugar together in a bag. 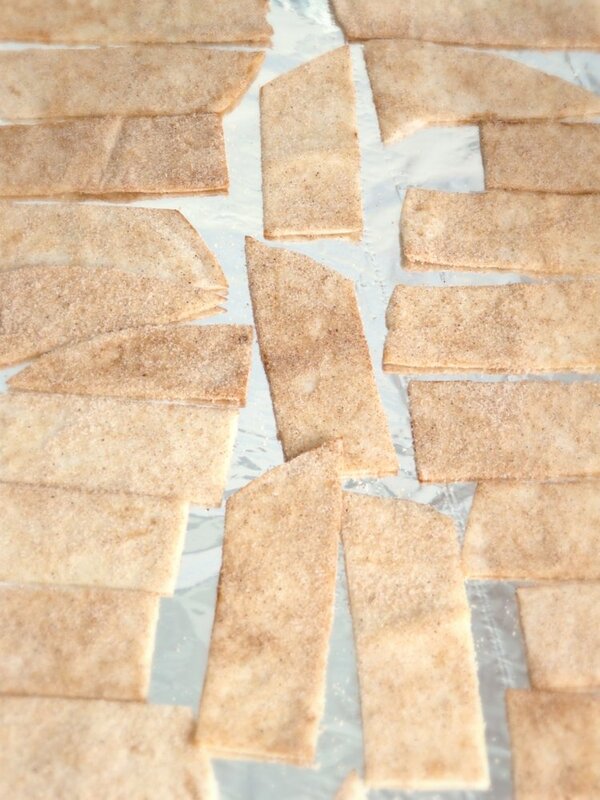 Add tortilla strips then shower them with some sweet cinnamon-y love. Bake them in a single layer. 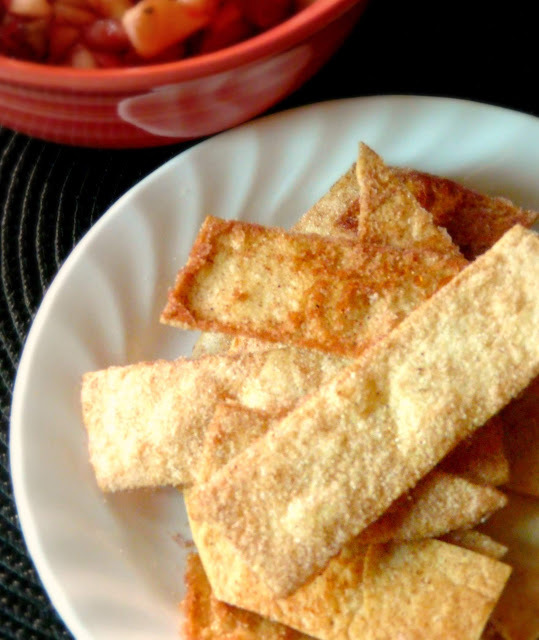 Sweet and crunchy cinnamon chips.